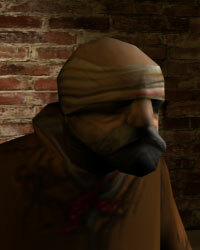 Darkel was scheduled to be a character in the 3D Universe who was to appear in Grand Theft Auto III before being removed during the development of the game. He was voice by Bill Fiore and, despite it being removed from the game, he is still credited in the game's credits. Darkel was to be a revolutionary urchin who would vow to bring down the city's economy. One known mission for Darkel involved stealing an ice cream van, using it to attract pedestrians and then blowing it up (this mission was given to El Burro as I Scream, You Scream). Darkel was originally expected to give out Rampage-esque missions and terrorist-like missions. Internal files suggest this to be accurate. According to Rockstar, Darkel was removed because his missions weren't "as good as the rest of the game", and because he didn't "work alongside the other characters". They also claim he was removed months before 9/11, disproving the rumour that he was cut because of the 9/11 attacks. Another Darkel mission was rumoured to have involved killing Donald Love by flying a plane into the Love Media building. Rockstar has, however, confirmed that rumour to be false as well, claiming the Dodo was never meant to be able to fly in the first place. Despite being taken out, Darkel remains listed in the GTA III manual credits and the character texture remains in the game's data files. A group of tramps with molotovs can be found in the tunnel that connects 8-Ball's bomb shop in Harwood to the rear of the Supa Save! in Portland View, supposedly remnants of Darkel's "gang" - a Liberty Tree article also alludes to a rise in tramp-related assaults. Darkel was supposedly meant to live underneath the Callahan Bridge, where he would give the player missions. This page was last modified on 9 December 2014, at 00:21.